The source is on page 158 of The Ladies Amusement published by Robert Sayer in 1762. This image was taken from a facsimile edition produced in 1959. Side view showing the painted blue and gilt band of decoration, and the ring handle form associated with New Hall. 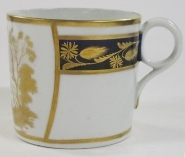 Hard paste porcelain coffee can, decorated with a wide band of blue ground with gilt hand-painted scrolling foliage and on the front with a bat printed decoration in gold, pattern 846. The print depicts a woman with a bundle of sticks in a rural landscape and is taken from The Ladies Amusement by Robert Sayer. The piece is unmarked but the gold bat-print and the handle shape indicate that it is a New Hall product.